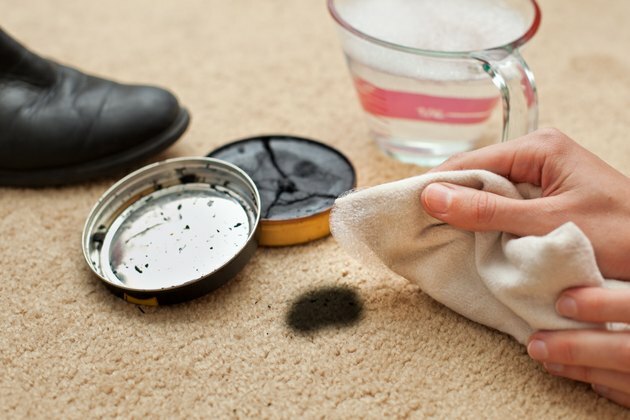 Shoe polish may help keep your shoes looking their best, but it has the opposite effect on carpet. A shoe-polish stain left untreated can spread when stepped upon, creating an even bigger mess. Rubbing the stain vigorously may also spread the shoe polish around. Instead, remove as much of the polish as possible before cleaning, and then treat the spot with one household stain-lifting substance at a time until the stain is gone. Test liquids on an inconspicuous area of the carpet first to ensure they don't stain or discolor the fibers. If a large amount of shoe polish sits on the carpet, scoop or scrape up as much as possible with a plastic spoon or the edge of a plastic knife. Keep a clean rag or paper towels handy to deposit the removed polish. Blot liquid-based shoe polish with white paper towels or an absorbent white cloth, swapping the towel or cloth for a fresh one as the polish is absorbed. Continue until no more shoe polish can be removed by blotting. Pour rubbing alcohol onto an absorbent white cloth, and use it to dab the polish-stained spot, holding the cloth over the spot for at least a few seconds. Inspect the cloth to see if it has absorbed any of the polish. If so, apply a fresh area of the cloth to the spot. Continue blotting with alcohol until no more polish is absorbed by the cloth. Dab the area with a fresh damp cloth, using water instead of alcohol, and follow up with a dry cloth to absorb excess moisture. Always use a white cloth when dabbing spills and stains — the cloth isn't dyed, so there's no chance of it bleeding onto the carpet. Liquid dish soap helps remove shoe polish from carpet fibers. Add a squirt of the soap to a cup of warm water, and then dip an absorbent white cloth into the soapy solution. Dab the spot with the cloth so it wets the carpet fibers slightly, without soaking the carpet pad beneath. Blot the area with a dry white cloth after a few minutes, and then wipe it again with a damp cloth to remove the soap. Blot the area dry once again. If some of the shoe polish remains even after you try several cleaning treatments, mix 1 part vinegar with 4 parts warm water, and wet the stain with the mixture. Dab with a fresh damp cloth after a few minutes, then blot dry. If the stain remains, mix 1 part hydrogen peroxide with 3 parts warm water, pouring a small amount of the liquid over the spot after testing an inconspicuous area — peroxide is a bleaching agent that may affect the carpet dye. Cover the stain with a thick white towel for 30 minutes to block light from reaching the carpet fibers, checking after 15 minutes to ensure the liquid hasn't lightened the carpet. Dab the area with a wet white cloth afterward to remove the peroxide, and blot with a dry cloth to remove excess moisture.